With such a massive family, a wide variety of special friends, and an increasingly unstable economy, ideas for unique Christmas gifts, as well as the money to pay for them, can sometimes be difficult to come by. Whenever I’ve been faced with a few friends and family members who are difficult to buy for, or money has been tight, my all time favorite solution is always unique gift baskets. While it is definitely true that I could easily hop in my car and head over to the local big box store and choose gift baskets from the “seasonal items” aisle for everyone on my Christmas shopping list in a matter of minutes, to be quite honest I have tried that route before. Not only did I end up spending my hard earned Christmas money for gift baskets that were completely impersonal, but they ended up being filled with cheap products and an abundance of shredded paper, cardboard and other “fillers”. Unwilling to give up on the idea of unique gift baskets for Christmas presents, however, I set out on my quest to find affordable gift baskets that actually offered something special. Grab a mug of cocoa, and I’ll show you what I found. The Night Before Christmas Gift Basket is one of my favorites when it comes to unique gift baskets for the whole family. Complete with a hardcover version of the popular Night Before Christmas book by Clement C. Moore, this festive sleigh gift basket is filled with an abundance of treats for everyone in the family and a variety of hot beverage mixes to wash them all down. A perfect choice for the individuals on your shopping list who like a little spice in their lives, the Blazing Bucket of Fire gift basket includes a metal watering bucket, 6 bottles of sweltering hot sauces, and even a fire extinguisher to cool things off! 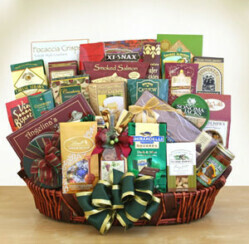 If you are searching for a gift basket that offers a variety of traditional homemade Christmas treats, the 2 lb. 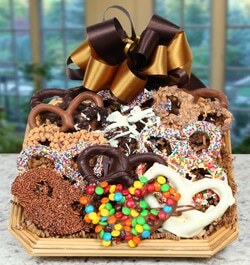 Chocolate Basket from Jackiesbaskets.com is an excellent solution. It’s filled to the brim with almond clusters, turtles, chocolate covered cherries and chocolate dipped pretzels, and would be a chocolate lover’s dream come true this Christmas. Consider purchasing an “of the month club” membership for your loved ones this holiday season, and give them gifts that keep on giving throughout the year. You can select fresh fruit gift baskets, wine gift baskets, baskets filled with gourmet treats, coffees, and much much more, and your gift basket selection will be delivered right to your loved one’s home or office each and every month for as long as you wish. If you plan to shop for your boss or coworkers this holiday season, the Corporate Extravaganza Gift Basket is just what you need. Overflowing with a wide variety of gourmet treats and decadent hot cocoa mix, this gift basket is certain to impress even the most finicky of recipients. Perhaps one of the most creative ideas for unique gift baskets is to create one yourself! Select things like collectibles, bath items, movies, special drinks and delicious treats and create a one of a kind gift basket for your hard to buy for recipients this Christmas. What are the most unique gift baskets you have ever received for Christmas?